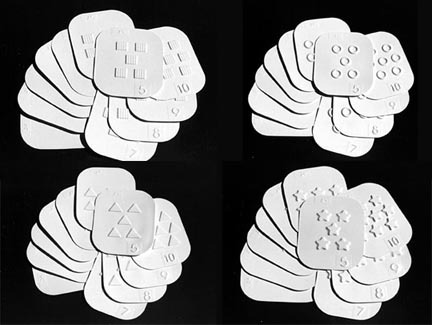 Important pre-reading and pre-math skills are nurtured through the use of CAL-tac Raised Shapes Counting Cards These cards provide children with the opportunity to develop knowledge and understanding of the process of decoding the symbols that are used to represent numerical concepts. CAL-tacTM Raised Shapes Counting Cards motivate children to track a page and help them develop kinesthetic feedback. Packet contains 4 sets of 11 5½" x 4½" white plastic cards. A guide to Suggested Activities is included.